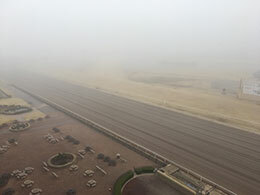 A foggy morning with temperatures in the low 40s greeted horses for the first day of pre-season training at Remington Park on Tuesday. The 2019 American Quarter Horse Season at Remington Park will begin on March 8. OKLAHOMA CITY, OK—FEBRUARY 5, 2019—The morning after horses were allowed to enter and be stabled in Remington Park barns, pre-season training started. Nearly 200 horses went to the track in cool and foggy conditions with Wave Topper posting the first official workout of the session. Jockey Ruben Castro was up as Wave Topper handled 200 yards in 11.72 seconds over a fast track, according to Remington Park clocker Vicky Grothaus. The Oklahoma-bred 3-year-old filly by Wave Carver, from the Mr Jess Perry mare Jess A Topper, worked at 10am for trainer Pedro Martinez. Wave Topper is expected to attempt her second career win during the upcoming season. Morning training will continue Wednesday, just ahead of the initial training race session of the pre-season. The first of eight training races will begin Wednesday at 11am. The events are utilized by many trainers in order to make their new horses eligible for pari-mutuel action racing. Oklahoma Horse Racing Commission stewards oversee the training races, all contested at 250 yards. The 2019 Remington Park Quarter Horse Season begins on Friday, March 8 and continues for 50 dates, through Saturday, June 1. Remington Park is always open for casino gaming. Simulcast horse racing is offered daily. Admission, parking and valet parking are always free at Remington Park. Guests must be 18 or older in order to wager on horse racing or to enter the casino. Tracked by more than 148,000 fans on Facebook and more than 9,800 Twitter followers, Remington Park has provided more than $210 Million to the State of Oklahoma general education fund since the opening of the casino in 2005. Remington Park is located at the junction of Interstates 35 & 44, Remington Park is in the heart of the Oklahoma City Adventure District. For more information, reservations and group bookings please call 405-424-1000, 866-456-9880 or visit visit remingtonpark.com.